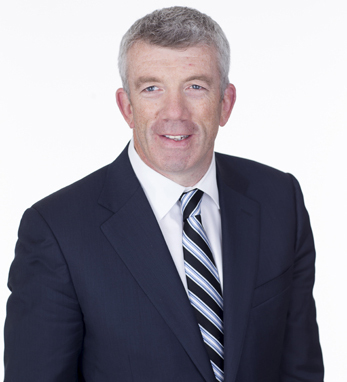 Hugh McGuire is CEO of Glanbia Performance Nutrition, a role he has held since 2008. He was also appointed to the Board of Glanbia in 2013 as an executive director with responsibility for Global Performance Nutrition. Previously, he held a number of senior management roles within the Glanbia group, and worked as a strategy consultant for McKinsey & Co. in the U.K. and Ireland prior to joining the group. Hugh began his career in the FMCG industry with Nestle in Ireland and worked with Leaf in Ireland and the U.K.
Hugh is originally from Sandycove in Co. Dublin and grew up swimming in the 40ft. He earned his B.Sc. as well as his M.Sc. in food science from University College Dublin. He also has a Diploma in Finance from the Association of Chartered Certified Accountants. Hugh and his wife Sue live in Chicago and have four children – Aoife, Rory, Donnacha, and Grace. When not traveling, or providing taxi services to his children, Hugh is an active fitness enthusiast who works out most days and participates in triathlons and marathons.